'Dreamer Of Dreams' ( Janet Hutchinson, R. 2001). Seedling GA/DWB/BK. LA, 34" (86 cm), Midseason late bloom. Standards ivory white; style arms green, deeper in throat, crests white; Falls ivory white, signal deep lime over yellow; edges fimbriate, form somewhat trumpet-shaped; slight fragrance. 'Gentle Alice' X 'Dural White Butterfly'. 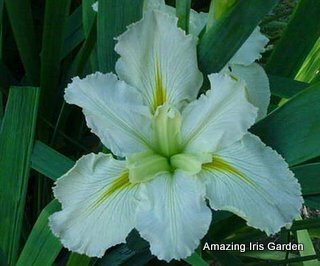 Iris Haven 2005/06.